Ancient South and East India: The Aryan people, who arrived in India around 1500 BCE, introduced a caste system in which people were divided into different classes according to the jobs they did. Children always belonged to the same caste as their parents, and each caste wore different kinds of clothes. The main castes were: the workers, who wore a simple tunic and turban; the merchants, who dressed in more colorful robes and wore golden jewelry; the warriors and kings, who wore magnificently patterned robes and turbans and masses of jewelry; and the priests and scholars, who usually dressed very simply in a loincloth, with their hair knotted behind their head. Buddhist monks have a “triple robe,” which consists of: a waistcloth, wrapped around the body like a sarong; a robe; and an outer robe, which is only worn in cold weather. Monks’ robes can be dyed from roots and tubers, plants, bark, leaves, flowers, and fruits, and these natural substances produce a range of colors from deep red to yellow. The most common color for Buddhist robes is a yellowish-orange, or saffron. While the ordinary people in the Gupta Empire wore simple clothes made from cotton, kings, princes, and princesses had splendid clothes and jewelry. 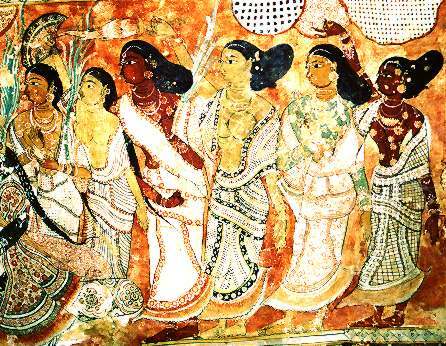 A set of famous Buddhist murals painted at Ajanta during the Guptas’ rule portray a group of exquisite dancing maidens, laden with jewels. The dancers wear flowing robes of the finest muslin. Around their necks, waists, arms, and legs are strings of pearls, beads, and jewels. Some have golden, jeweled headdresses rising in points, while others are bareheaded with jewels and flowers woven into their hair. Do you know the types of heels?